This unique sport is gaining popularity across the country and it’s catching fire among kids and adults in our area. Meet the players who make up the Ravens ruby club and find out how they’re making a positive impact. Paula Whiteaker says watching her son Benjamin practice with the Rockford Ravens Rugby Football Club has been a joyous experience. Benjamin, 14, who’s autistic, is accepted for who he is on the field, which warms his mother’s heart. Established in 1976, the club is a place to play rugby, make friends and serve in the community. The rugby club has expanded in recent years to include youth and adult teams for both men and women. The women play at the Division II level and the men play in Division III. Whiteaker says Benjamin’s age, coupled with his skillset, makes it hard for him to play with the club’s high school students. 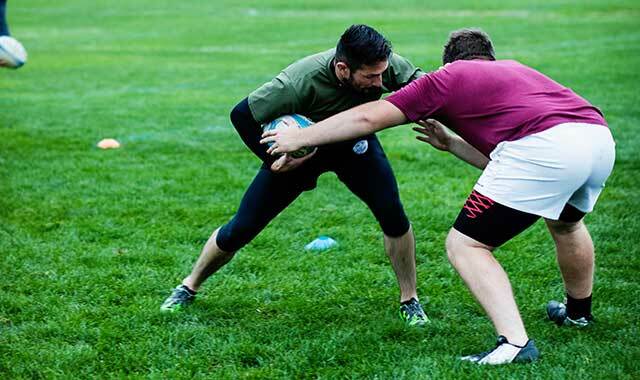 Since there’s no middle school rugby program in Rockford, he’ll play games with middle school students from the Fox Valley Predator Rugby Club in St. Charles. “He practices locally in Rockford because he’s learning skills, techniques and his age group doesn’t play until February,” says Whiteaker, a teacher in the Rockford Public Schools District. The teams function under the governance of The Forest City Rugby Union, a nonprofit. The object of rugby is simple, but the rules are complex. Each team can have 15 players on the field and points are scored by grounding the ball in your opponent’s end zone or by kicking it between goalposts at opposite ends of the field. During the game, players can move forward toward their goal by kicking, carrying or passing the ball. The catch is the ball can’t be passed forward. Tackling a player can stop forward progress of an opponent carrying the ball. Once a player is tackled, they have to release the ball. The only equipment used to play rugby is a mouth guard and cleats. “With rugby, there are more rules surrounding tackling than in football,” Deuerling says. “In rugby, you’re taught to tackle with your head on the outside, so you don’t cross in front of your opponent’s body.” Deuerling says Rugby tackling shares many similarities to a double-leg takedown in wrestling. The rugby club has 23 men and seven women. The high school teams consist of 16 girls and 18 boys. Adults in the club range in age from 18 to 45. Deuerling says the roster is created thanks to a lot of legwork. The teams play opponents across Chicagoland, Indiana and Wisconsin. Home games are played at the Mercy Health Sportscore 2, 8800 E. Riverside Blvd., in Loves Park. The program participates in an eight-game regular season and a playoff format. The men’s team won a league title in 2012. “We start practice for the fall season at the end of July and the first games begin in August,” Deuerling says. Once the season ends, things are pretty quiet until February, when the teams start preparing for the spring season. “We’ll practice indoors for the spring season around the middle of February and the first games will begin in March,” he says. In addition to the traditional rugby season, the men’s team will travel to Germany later this fall, where they’ll take on several teams during a rugby tour. The team will play clubs in Munich and Nördlingen, Germany as well as Salzburg, Austria. “We’ll play clubs in each city, experience the culture and make some lasting memories,” Deuerling says. When the players are not on the field, they’re working together to help those in the Rockford community. The group volunteers their time by participating with Keep Northern Illinois Beautiful. Team members collect and recycle used metals and electronics and pick up litter around the community, among other things. The group is also trying to start an annual event called Rent a Raven, where group members will provide assistance to community members that need help doing yard work such as raking. If you have an interest in rugby, and you’re willing to drive to Rockford, Deuerling suggests coming to a practice and speaking to some of the players. The team practices Tuesday and Thursday evenings at Sportscore. You can also visit rockfordravens.com or the club’s Facebook page for more information. This entry was posted on Tuesday, October 23rd, 2018 at 12:00 pm	and is filed under Recreation & Destinations, Top Posts. You can follow any responses to this entry through the RSS 2.0 feed. Both comments and pings are currently closed.